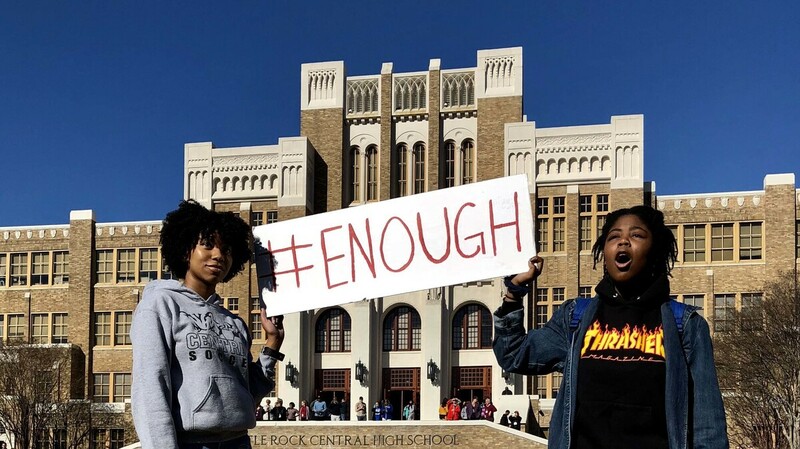 Central High School Walked Out In The Footsteps Of The Little Rock 9 Best known for its role in the 1957 school desegregation crisis, Little Rock Central High School saw hundreds of students walk out of class on Wednesday to protest gun violence. Students hold signs in Little Rock Central's walkout on Wednesday to protest gun violence. Little Rock Central High School in Arkansas is no stranger to protest. Sixty years ago, following the Supreme Court's historic Brown v. Board of Education ruling, Central drew national attention as nine black students attempted to integrate the previously all-white school. The Little Rock Nine, as they came to be known, were prevented from integrating Central by crowds of angry protesters. Arkansas Gov. Orval Faubus even ordered the state's National Guard to block any attempts to enter the school. Eventually President Dwight Eisenhower seized control of the Arkansas National Guard, and deployed federal troops to ensure the students could enter the school. While the students were able to finish the school year, the controversy continued. Gov. Faubus fought in the courts to prevent integration, and ended up shutting down the city's entire public high school system in what became known as "The Lost Year." But this year the student activists walked out, not in. The school suspended classes for 17 minutes — one minute for each life lost in last month's shooting at Marjory Stoneman Douglas High School in Parkland, Fla.
A majority of the 2,500 students joined in the walkout, with the support of school officials who said they viewed the protest as a once-in-a-lifetime educational opportunity. Students and administrators said they see the walkout as the continuation of a legacy of fighting for change. "The Little Rock Nine stood up for what they thought was the right thing for their education and their futures, and that's what the children did today," Principal Nancy Rousseau told NPR. "Central is a cornerstone for change. And I think that it's our responsibility to recognize that," added Central student Ollie Burrow, "and realize that we can achieve that as well." "This was a peaceful, organized protest led by students," Burrow said. "We wanted to be sure that our message was heard and that it was clear." Organized by the student council, the walkout was part of a nationwide movement with similar protests at high schools across America. At 10:00 a.m., Central students exited the school and occupied the front lawn. School administrators shut down the street in front of the school, and brought in extra security and police personnel to ensure a safe, peaceful protest. Students with megaphones led their classmates in chants, gave speeches, and spoke with local news media. After 17 minutes, the students released 17 white balloons in remembrance of the Parkland shooting victims. "I stand with Parkland," student body president Erin Farmer told NPR. "I should never have to take a class on how to dodge a bullet," she added, "I shouldn't have to come to school in fear." History teacher Chuck West lauded the cooperation between students, educators, and school administrators. "We were encouraged to talk about it beforehand, and to make sure that the kids were respectful to one another, that there was no peer pressure to do it, and that people took it very seriously," he said, "and from my perspective, that was honored by the students." Ian Wren is an intern on NPR's Business Desk.